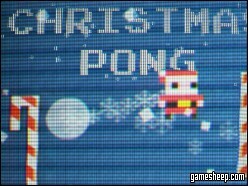 Objective: Christmas Pong is an amazing itteration to the timeless classic Pong. Enjoy this Pong game in single- or two player mode. Move the paddle up or down and score points that are tracked at the top of the screen. We are glad that you have chosen to play Christmas Pong on GameSheep.com, the most dynamic website available. If you like this game Christmas Pong don't forget to rate it and this way you will help with selecting only the best games for the home page.